There seems to apps popping up for everything, the mobile app industry is estimated to be worth over $100billion by the end of 2020. The good thing is, you don’t even have to be a developer to create an app. There are courses that have eliminated all the hard coding required for an app and made app creation simple. Of course, Apple and Google dominate the app scene, 88% of smartphones sold in the final quarter of 2016 were powered by Google’s android operating system while Apple managed to get 11% of the market. There are a lot of websites that allow you to build apps without coding, if however, you want to build Apps from scratch with coding, then I suggest you check out the variety of courses available on Udemy and Lynda.com. If you can’t think of what kind of app to create, then go to this brilliant website, where you will see app ideas from people around the globe. Like I mentioned you can also build mobile apps with zero coding experience required. Similar to how anyone can now build beautiful websites without any knowledge of HTML, CSS and PHP, there are many platforms that will let you build complex apps without much effort. Here are some of the most popular app builders that require little coding skills. Drag and drop app builders are fairly new and so some may not have a lot of functionality. It’s still fun to play around with and develop your skills. Appinstitute – One of the largest app developers in the UK, powerful drag and drop builder and offer a diverse range of templates for different industries. GoodBarber – Don’t know who thought up the name, this is probably the most powerful app builder. Has very advanced features and their monthly price plan is competitive. If you don’t want to build apps, they provide a reseller service, so you can market their products as your own. Mobincube – The app builder for everyone, they have a free plan to build your app. It has some powerful features and their interface is very intuitive and easy to use. There are two ways to monetise your apps through mobincube, in app ads and their own affiliate programme. ibuildapp – Offers a wide vareity of tools and features to create any kind of app. Has over 144 templates you can choose from covering all the industries. Has three price plans from a solo developer to large corporations. Lists Unilever, SEGA and UCLA amongst others as its clients. Running a successful blog is exhausting and time-consuming, however, if you do it for something you feel passionate about, it can be rewarding. There are a variety of resources teaching you to build a successful blog, but it’s all about starting somewhere. We have all seen how some of the best marketers in the world have brilliant blogs from Neil Patel’s quicksprout.com to Brian Deans backlinko.com, these blogs draw in millions of visitors each month and they provide a tonne of information. Do not just rely on Google for traffic, diversify. Of course, there are many ways to monetise your blog, you can sell your own digital products like PDF guides, ebooks, online courses, or through affiliate links and advertisements. Yup, if you haven’t been living under a rock for the past decade, you should know the video sharing platform that is YouTube, has produced thousands of successful entrepreneurs. Until just recently, one of their most successful artists was a YouTuber named pewdewpie who became a millionaire by just playing video games. Not only is YouTube used as a medium for entertainment but also for news, learning new skills, interacting with people from around the world. Just like a blog, you need to engage your audience and provide them with value for their time. You don’t even have to show yourself if you are not confident in front of a camera. There are video editing software tools that will let you make all sorts of video that will not require you to be on screen. Reviewing Films, TV shows etc. There are many other categories but the above should give you an idea of what you can offer on YouTube. You can monetise your channel through affiliate links, advertisements or selling your own products. YouTube also provides one of the best sources of free traffic for your website or blog. YouTube also provides one of the best sources of free traffic for your website or blog. There are many more ways to make a good income online, I have just mentioned the most popular methods. So many people are making good money with the methods mentioned. You just need to act and not be deterred if things do not go your way quickly. Treat it as a real business and always be looking to learn new ways of doing things. Also, please don’t jump from one opportunity to another, find something, stick with it and make it work. And be aware of schemes that promise you the world, there are no successful get rich quick schemes, only unethical marketers looking to make a quick buck from your enthusiasm. 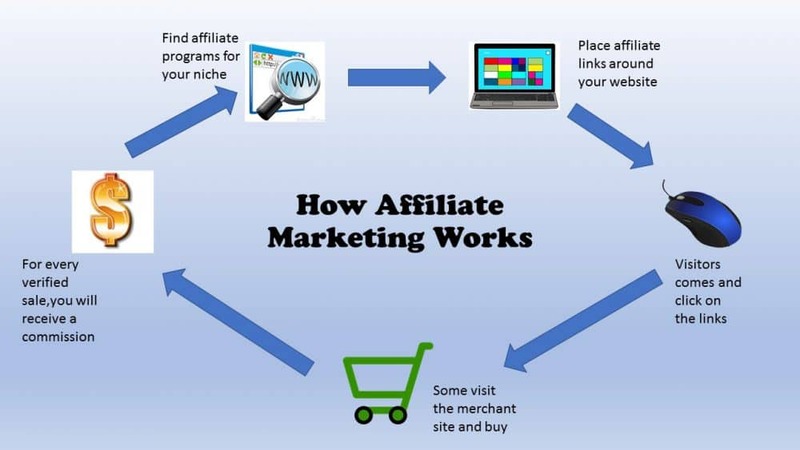 My personal recommendation to start an online business is affiliate marketing and the best training available is from Wealthy Affiliate. If you feel I have missed out on a legitimate way of making money online, please let me know by leaving a comment or even if you disagree with what I have to say, leave a comment and I will get back to you as soon as possible. WOW so much good information for a novice like me wanting to get started!, thanks for this, it has helped me out immensely. Thanks, Aaron, glad you found it useful. There are immense opportunities on the internet, just have to avoid the sharks. Thank you for your article! It is really interesting. Who knew that there are so many opportunities to make money online. I still live with the impression that is still 2008-2009, but the sad truth is that it is already 2017. With time passing, more and more opportunities rise. Thank you for listing them to me. In your opinion what do you think it is the easiest way to earn money? Are there sources of income that could replace a full time office job? Thank you for your answer! I think it all depends on the individual, some people love writing, so blogging may be a good way for them to start an online business others prefer providing a service. The opportunities with a low-cost entry point are probably the best for newbies to start an online business like affiliate marketing or providing a simple service. I think all the methods mentioned, if done right, could potentially replace your day job, but as with everything in life, it needs time, effort and persistence. Great page! Tons of helpful info and resources. Thanks for putting this together. Thanks for stopping by and commenting, glad you found the information useful. Hello and thanks for sharing, you have written a well detailed post on this subject. I am sure that your readers will love what you are offering. Online business is great but it calls for a lot of work, but the rewards are there as long as you are willing to ride it out. Hi Norman, thanks for stopping by, hopefully people will see there are realistic ways of making money online without being deceived by scammy sales letters promising you the world. Hi. This was a very informative post. Thanks for sharing. Hi Brien,Glad you found it useful. Great post! Packed full of information. I have learned about a few different methods to make money online that I didn’t know about before. Will definitely stop by again to find out more from your great posts! Thanks for the kind words, I’ll be more than happy to help you out in any way I can. Just shoot me a message and I’ll see what I can do. Hello, there so so much ways that you can make money with your computer that it is so amazing, thanks for sharing your post that is well detailed and filled with good information. I am sure that you readers will love the breakdown of your post, tons of good information, that is so easy to follow. Thanks for the kind words, I hope they do benefit people and help them in their entrepreneurial journey. Wow. You’re site is intimidating. Very professional and informative. A lot of detail in your first page. I only wish I knew how to create content and comparisons like that. Great job. You will go far. Thanks for the kind words, don’t feel intimidated, its all a learning process and always remember you are trying to help people as much as possible. The more you write content the better you will get at it. Nice post! It has much information that i am looking for. A totally nice way to earn money and I was unawared of these ways. Anyhow, you explained well. Thanks for sharing! Thank you for this review about 6 ways to make money online. I know how affiliate marketing works. I didn’t know how drop shipping worked. That’s more intensive than affiliate marketing, because you have to order. The same counts for providing a service, you are more involved too. I have a YouTube channel, I am waiting for the luck to go viral one day, you never know, but I am out there:) For now, I point my arrows on affiliate marketing. It’s easy, you do not have to invest, at least not a lot, perhaps in some training, and this market is growing really fast. Very educational and informative. I have been a a part of some of these,alidropship,oberlo. A few I did not know about Amazon FBA I have always wondered how you became a part of Amazon,now with your article I know! Besides Wealthy Affiliate ,which in my opinion is one of the best training all in one platforms out there for affiliate marketing…What would your second choice be for legit home income? Thanks for your comment, as for Wealthy Affiliate alternatives, I would say Affilorama and Clickbank University, however, both these have a few upsells and their core product is not as good as Wealthy Affiliate.